UMX Table Of Easy-Add-On Hardware Attachment For 3/4" Quick Release Snap-On Lanyards. We provide an array of most commonly used hardware for 3/4" snap closure quick release lanyards. You can buy any hardware attachment to add onto your snap closure quick release lanyards easily. You can also buy different style of hardware attachment for different applications or put more than one hardware on one lanyards. You can connect or disconnect every attachment or hardware at your convenient without using any special tools. No Special Tool Needed - Easy to connect, disconnect or exchange is the beauty of our snap closure detachable lanyards. 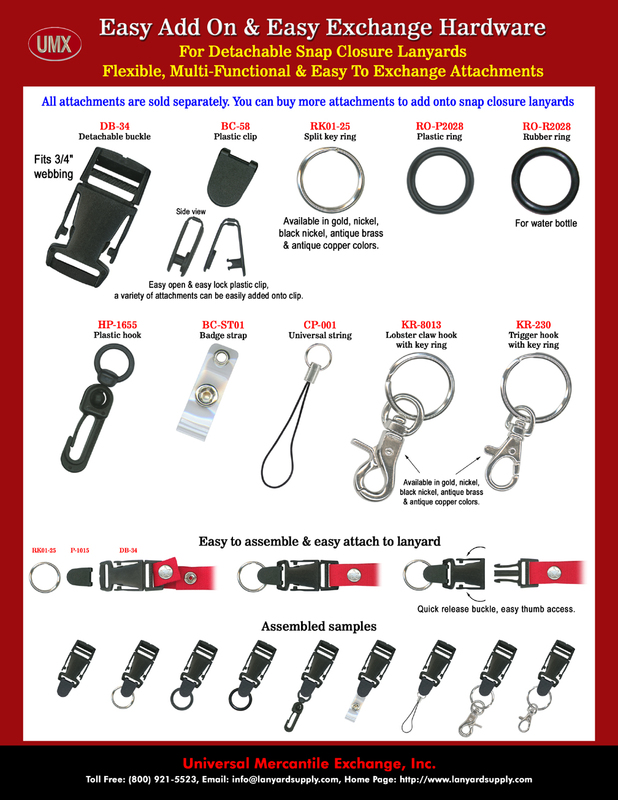 You are viewing Lanyards > Snap Closure > Table Of Easy-Add-On Hardware Attachment For 3/4&quot Quick Release Snap-On Lanyards.